ATLANTA, Ga- It's snowing full force in Atlanta but one courier service is still delivering packages. 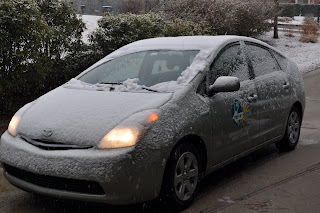 Green Express, Atlanta's Only Eco-friendly courier has its hybrid-electric car fleet on the road making sure documents are being delivered business to business. There are a number of traffic delays due to the inclement weather however the Green couriers indicate all packages are right on schedule. If there are any problems with traffic which would make the delivery late, Green Express customer service folks always call the customer. Green Express customers can check their on-line tracking to check the status of a delivery 24 hours a day. Giving the customers the ability to follow up on delivery status has reduced calls and increased customer participation. As the snow continues to fall, Green Express will monitor the traffic while making sure deliveries get to their destination. For Atlanta deliveries, call 770-394-3131. To set up an account with GREEN Express, click on this link.